I’ve been pondering the excellent 1964 history of the Southern Song Dynasty’s capital of Hangzhou, Daily Life in China on the Eve of the Mongol Invasion, 1250-1276 by Jacques Gernet, in light of the Chinese government’s unprecedented “Social Credit Score” system, which I addressed in Kafka’s Nightmare Emerges: China’s “Social Credit Score”. The scope of this surveillance is so broad and pervasive that it borders on science fiction: a recent Western visitor noted that train passengers hear an automated warning on certain lines, in Mandarin and English, that their compliance with regulations will be observed and may be punished via a poor social score. In the early days of the Communist revolution (1949 to 1965), the majority of China’s populace embraced the values and authority of the Communist regime, despite the monumental hardships and setbacks of the Great Leap Forward (millions dying needlessly of starvation) and other centralized incompetencies. In broad brush, the Cultural Revolution broke the social power of the Communist Party and government. Thereafter, the Party and the state only had force at their disposal. The rise of broadly distributed prosperity (Deng’s “to get rich is glorious”) replaced the failed power of Communist ideology with a new social contract:obey the party and the state and you’ll become prosperous. If this new contract were considered rock-solid power, why would China’s government need the vast surveillance system they’re putting in place for fine-grained control of the populace? It suggests to me that the leadership (Xi and his cabal) are aware that the prosperity is not permanent, nor is it being distributed evenly enough to harmonize Heaven and Earth. Sensing their lack of social power, they are turning to technology to create a vast system of coercion (force). Force is not a substitute for power. For this reason, the “Social Credit Score” system smacks of desperation. But China’s history is clear: the culture and the people prefer a system in which power is maintained through social norms, not force. With Communist ideology a dead force, and prosperity about to wither, what’s left? A system of forced obedience backed by Orwellian technology. Other governments are keenly interested in following China’s lead. “Prosperity” isn’t just phantom and asymmetrically distributed in China; it’s phantom and asymmetrically distributed almost everywhere, and so other governments are just as desperate to protect their elites and control their restive populaces. 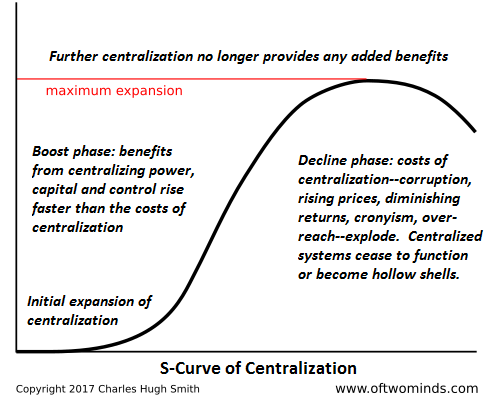 Centralized force has limits. Like everything else we reckon has god-like powers, it works until it doesn’t. This entry was posted in General and tagged China, Kafka, Orwell, s-curve, social credit score. Bookmark the permalink.